There is a truth about information. Too much of a good thing can be bad. But too much means just that. I found that recently in following the Malaysian air crash where bad information appeared to be all we had. Take a look at what usually is a font of detail and well thought out aviation commentary , www.pprune.org. As I followed the incident, usually informed pilots began a series of really bizarre speculation after flight MH370 disappeared. The most fallacious of these was the theory that an on-board fire had led to some kind of incapacitation. As I read their commentary, it became apparent that the commercial pilots were all fumbling about trying to find a reason not to blame the accident on a possible crew member. 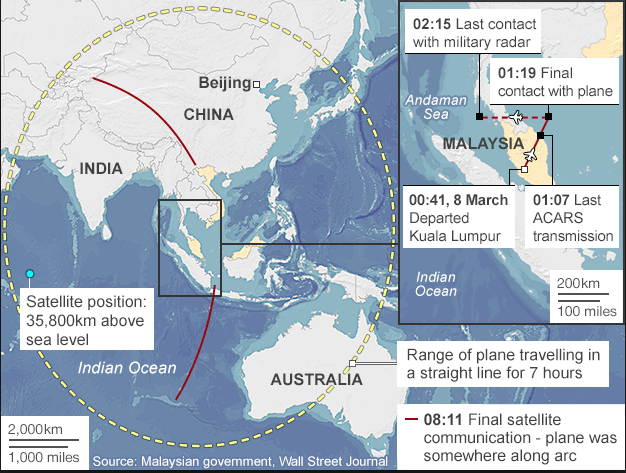 Now weeks later the speculation continues with stuff about how the plane could have filled with smoke, the pilot turned around and lost altitude and then tried to make it back to Malaysia. But the facts (and they are facts) just don’t add up. The plane was flown by a highly trained pilot in order to accomplish the difficult and sudden reversal of course, then flew a route AWAY from known ground based radar, back over the north of Malaysia, then towards northern Indonesia. Once again, it was turned AWAY from known ground based radar, and the last course was deep into the southern Ocean. What motivated the pilot to commit this act? None of these can be explained by an on board fire. What we do know is that whomever changed course initially did it at PRECISELY the point where Malaysian ground radar would lose the plane, and Vietnamese ground radar would supposedly pick it up. At that very moment – and we’re talking less than a minute here – the pilot and possible assistants switched off the transponder, turned and in the next three minutes disconnected the additional reporting technology on board. Apart from a ping from the Rolls Royce jet engines every hour that has allowed us just the faintest whiff of a trail. Any attempt at suggesting fire is just a smokescreen, if you excuse the crude pun. But what’s worrying me is the phalanx of baloney spouted by really smart long-serving pilots whom I formally respected greatly. During the Air France crash over the Atlantic, I followed the same kind of pilot commenting on the zone and they were far more informed and less likely to be emotional. At the same time, the Kuala Lumpur authorities have not only been criminally abysmal in their reporting, they’ve damaged the perception of their country by lying because of some kind of weird “saving face” culture. All that succeeded in doing is angering the Chinese and confusing the already poorly informed journalists. The Malaysian chaos response was pathetic and I kept thinking about the families of the passengers and crew. How callous for a person in authority to crack jokes and expound on mumbo jumbo they clearly fail to understand, with so much death and dispair ignored? Months/years of undersea scouring leading to an eventual location of the remains of the plane. And given what we’re heard and seen, I believe the wreckage will NOT be scattered across the floor. It will be condensed because what is now clear is that the highly experienced pilot in control of MH370 took the plane as far off its course as is humanly possible, then ditched the aircraft in an oily sea – probably only losing part of a wing, or perhaps landing well enough to maintain the aircraft’s integrity. Allow me a speculative moment. He (likely) tried to do a Miracle on the Hudson landing in order to obfuscate any search by ensuring a most unlikely scenario. That it sank in one or a handful of large pieces. Thus, we have no sign of mass debris, the doors were closed so cushions and life vests and bags and hats and coats which remain on board are contained within the fuselage. And so too the bodies which await discovery around 26 000 feet down on the ocean floor. What of the motive? We can’t say until we find the wreckage and begin to piece this strangest of air crashes together. This entry was posted in Uncategorized and tagged Kuala Lumpur, MH370, pprune.org, Vietnam by desmondlatham. Bookmark the permalink.